Time for the fun part—house shopping! By now you’ve pictured your perfect house and know it’s out there. Keep in mind, the average buyer typically looks at 15 houses before buying one. So don’t get discouraged if you don’t find it right away. With a huge decision like this, it’s going to take a while. Like with any kind of shopping, whether it’s groceries or gifts, you usually start off with a list. House shopping is no different. Sit down and put together a list with three columns: Must Have, Nice to Have and Don’t Want. Think of your realistic dream home and put the specifics down in each column. Have this with you when you’re house shopping or even looking at MLS listings from your Realtor. This way, you won’t get caught up in the moment when you’re inside your potential new home. Do you have an general idea of where you’d like to live, but still have to narrow it down? Don’t make your Realtor do all the work; get in your car and drive around some neighborhoods. And don’t be shy; if you see some future neighbors outside, talk to them about what it’s like to live there—the good and the bad. You don’t need a Realtor to look for or buy a home, but they sure help. And it doesn’t cost you a penny; the seller ends up paying their commission. 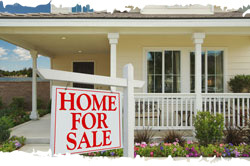 But if you see a for-sale-by-owner sign and want to take a look, go right ahead. Without a commission in the picture, you might get a better deal. A Realtor can take your shopping list and plug it into their multiple listing service (MLS) and come up with a list of homes for you to review on paper and maybe see in person. There’s no need to rely solely on your Realtor, feel free to shop online (check out our related links) or check out the real estate section of the newspaper. With the current economy, there’s a bunch of bank foreclosed homes on the market. If you’re lucky, you might even find a steal this way. Just keep in mind that many foreclosures need a lot of TLC. So, if you don’t have the budget for a fixer-upper or aren’t handy yourself, you might want to think twice. Okay, so you’ve searched, driven by and walked through at least a dozen houses. Time to narrow it down to one or two. Make sure you get the seller’s disclosure on the house. Sellers legally have to fill this form out, it lists the defects they know about in the home and usually the age, if known, of things like the appliances, furnace, roof and water heater. Get your original shopping list back out and see how it meets your criteria. Be brutal about it, you don’t want to have any buyer’s remorse when this is over. And this is no time for an impulse buy. Visit the house at least twice and sleep on it before you sign on the dotted line. If you think you’ve found the right house, Making an Offer is the next step.